The 2018 WSOP continued on Wednesday with two more bracelets at stake. Tommy Nguyen won his first bracelet with a victory in Event #48 $1,500 NL MONSTER STACK. The Canadian pro scored a little more than $1 million. 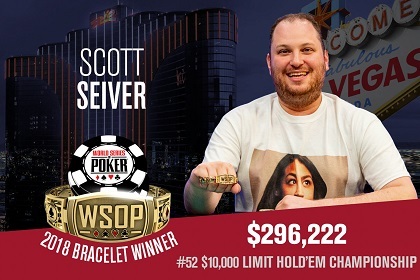 Meanwhile, Scott Seiver picked up his second bracelet with a comeback win in Event #52 $10,000 Limit Hold'em Championship.